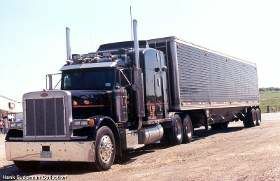 I am 35 years old and truck driving is certainly the job that I have had thus far with the most responsibility. All of the people up above have inspired me to either start writing this blog or keep on trucking. I figure if they can do it, so can I. My biggest passion in life is learning about the natural world and more specifically permaculture! I couldn't go on any longer without mentioning permaculture. It's just too important. It is the ideology that has the most potential to change the world for the better, except for maybe religion. If you want to challenge me and say "no, religion has more potential" i concede defeat. Everyone should check out permaculture though. That brings me to my ulterior motive for doing this blog and one of the good reasons why I got into trucking. My biggest dream ever by far is to homestead someday. Homesteading for the rest of my life sounds like it would be just pure, unadulterated freedom. I am sure there are disadvantages and all that, but...still...imagine the freedom! It is not fathomable to me why this is not at the forefront of everybody's to do list. To me, that is just living. Why isn't the homesteading lifestyle lauded as the creme de la creme of all lifestyles, the Bentley, the Saffron, filet mignon? It just escapes me, leaves me indubitably dumbfounded. The ulterior motive for doing this blog is to find a path to that lifestyle. I hope to be able to express and organize my thoughts with this blog and ultimately connect with other like-minded people that feel the same way I do. One of the ulterior motives that I had when getting into trucking was to scout out the country and see where the best place to go about this dream would be. I have had Old Horse Springs, NM picked out on the map for a long time, but it looks very, very desolate out there (on the map) and lonely. It doesn't have to be that way. Urban homesteads are becoming more and more popular nowadays. I think I will sign off for now. Thanks for reading my very first blog!